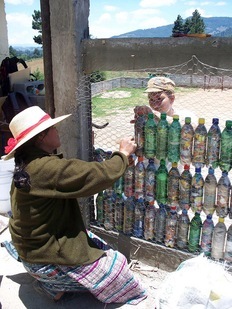 When former Peace Corps volunteer Laura Kutner was asked to help find funding to finish constructing two classrooms in the elementary school where she worked in Guatemala, she decided to use — or rather reuse — a common piece of trash. She used what was known in environment-friendly circles as “eco-blocks” — plastic bottles stuffed with inorganic trash — and encased them in chicken wire. Once covered in a few layers of cement, the bottles provided cost-efficient and eco-friendly insulation for the classroom’s walls. “They stay cooler than traditionally built schools and have even inspired new community initiatives to find everyday solutions to trash management,” Kutner said. 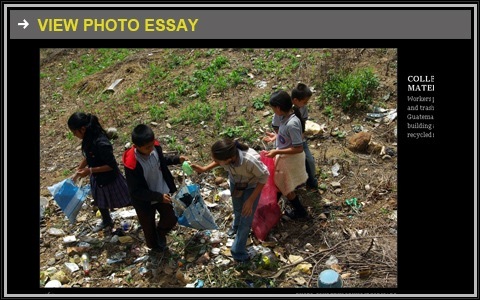 Like many small towns throughout Guatemala, large amounts of trash in Granados remain a growing problem for the local government. Although Kutner said the project in not a long-term solution to trash management, it has brought a great deal of awareness to the issue and to the importance of recycling. The project commanded the combined effort of hundreds of students, parents and volunteers who spent weeks collecting nearly 8,000 bottles for the schoolhouse, bringing together the entire community. When the project ran out of money, Hug It Forward, a non-profit organization based in San Diego, provided the remainder of the funds needed to cement the walls and finish the floors and windows. After the schoolhouse was completed, Kutner continued to train other community members on the technique and the idea spread like wildfire. Other volunteers asked Hug It Forward to start funding their projects, and before long the small non-profit was supporting the construction of several schools throughout the region. “Hug It Forward started as a free hug movement, but we later decided to integrate something that was more concrete,” said Zach Balle, one of the founders of the organization. Balle and the other volunteers at Hug It Forward are now working on scaling up the Bottle Schools project so that it can be duplicated in other regions around the world. Their focus is on helping communities with poor educational infrastructure implement solutions that they can do themselves, instead of an outside organization. After submitting a photo of all the collected bottles and inorganic trash needed for insulation, individuals will receive funds to purchase building materials and construction tools. “That’s their buy-in,” Balle explained. Hug It Forward also offers training, instructions and advice via Skype. Both Balle and Kutner agreed that ownership can at times be the hardest — though most important — part of getting these projects off the ground. “In development, if a community does not want it or does not need it, the project is not going to be successful,” said Kutner. A community has to be able to invest in itself to be sustainable – and that, after all, should be the goal of grassroots development, she said.